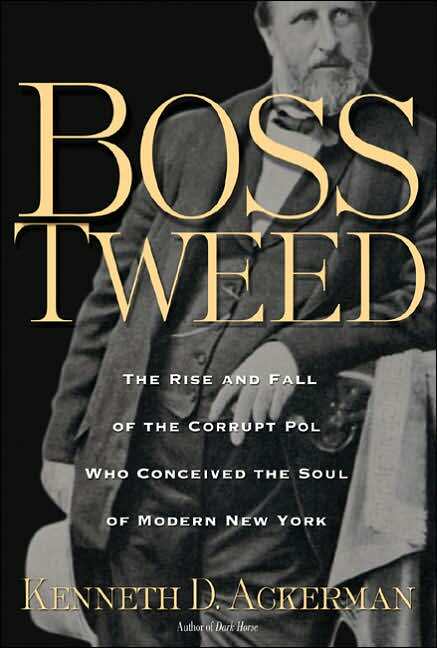 Kenneth Ackerman, a praticing attorney in New York City, has written a new biography of the country's most notorious corrupt politician, Boss Tweed: The Rise and Fall of the Corrupt Pol who Conceived the Soul of Modern New York. This fair and honest biography neither romanticizes nor condemns Tweed, but rather, in an eminently readable style, it simply tells the story. Tweed made his mark and began his meteoric rise to power in the 1863 Civil War draft riots. While others cowered or silently acquiesced to the violence, Tweed used his influence to calm the city. 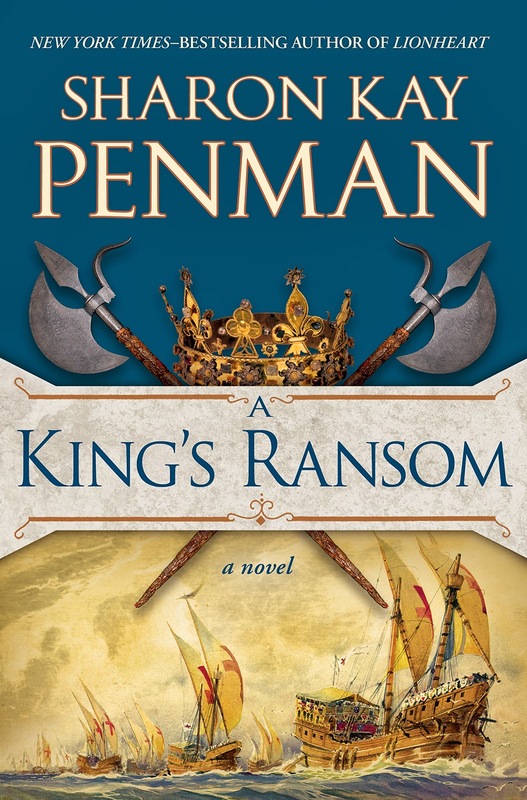 Within five years of patronage and petty graft, William Tweed had soldified his power, rising to the position of Chief Sachem of Tammany Hall, New York State Senator, and Commissioner of Public Works for the City of New York. After pushing a new city charter through the state legislature, Tweed began to fleece the city on a scale unprecedented in the annals of American history. Though the total amount will never be known, the Tweed Ring filched between $20 - 45 million (multiply by 20 for current dollar amounts), though some later estimated the total at $200 million. What made Tweed different from corrupt pols prior or since, besides the grand scale, was that the city of New York greatly benefitted in the process. The Tweed governme nt led to the paving of roads, laying of sidewalks, running water, and tremendous building, including the court house that informally bares Tweed's name to this day. All this was done without raising taxes but through debt financing, the selling of bonds, particularly in Europe. In fact, it was the financial hanky panky that finally ended Tweed's reign. 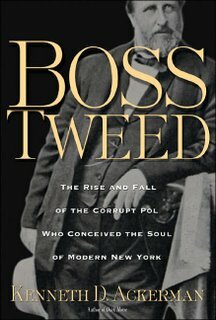 Tweed's financial downfall was precipitated by a year long campaign by two newspapers and two men, the New York Times' founder George Jones and Harper's Weekly's lead illustrator Thomas Nast. It was their struggle to undermind Tweed that finally led an disloyal insider to leak the financial statements that brought an end to the corruption. In some ways, Jones and Nast transformed American journalism from a heavily partisan mouthpiece into the public watchdog that it is today. After a failed escape to Cuba and Spain, Tweed finally agreed to tell his side of the story in a final bid to return home. Cheated by the prosecutors who sought to extract public vengence from at least someone, Tweed would die a broken man in prison, deserted by his family as well as all those who had once been friends, colleagues, and co-conspirators. Ultimately, Boss Tweed would not be forgotten though. 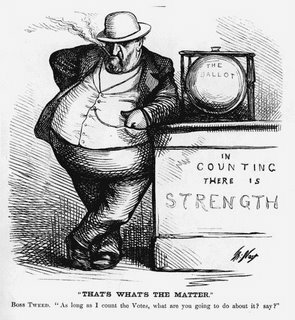 In his own time, thousands of former constituents would attend Tweed's funeral while today every American student learns the name of Boss Tweed. Kenneth Ackerman has done Tweed and history a great service. Boss Tweed is must read for every New Yorker, every would be politician, and anyone who loves a good story.